If not, stay with me a little while. Welcome to the twenty-second century. Anderson Lake is the right-hand man of AgriGen in Thailand, a kingdom closed to foreigners in order to protect their precious ecologic reserves. But Anderson's job as a factory manager is actually a cover. Anderson combes the street stalls of Bangkok in search of the most precious booty for his masters: the food that mankind believed extinct. His mission is to discover the seed stock of unmodified plants disappeared many years ago in the rest of the planet, who mysteriously has been preserved in the isolated Asian kingdom, and deliver them to the multinational of biotechnology for which he really works. 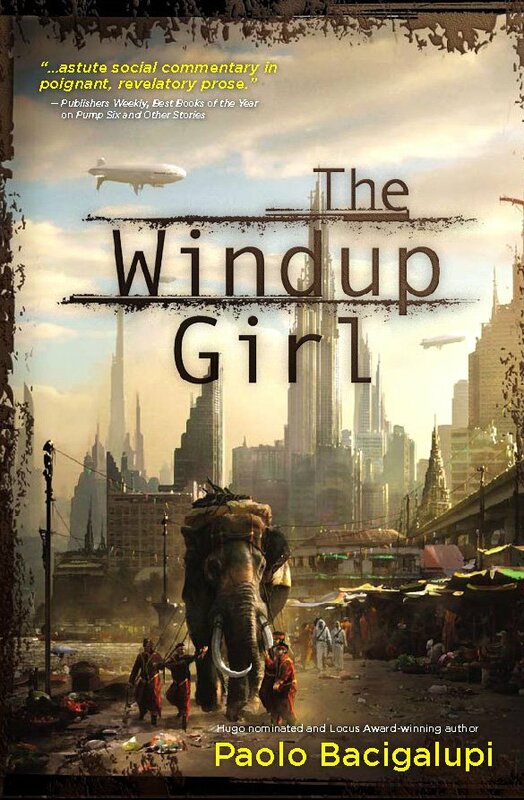 Emiko is a «windup girl», the last link of genetic engineering designed to serve. Accused by some of lacking a soul, accused by other of being devils incarnate, they actually are slaves, soldiers o sexual toys to satisfy the rich in a future disturbingly close. This book is written beautifully with an air of gritty, honest truth that lends reality to the bleak, tense, terror-stricken mood of the dying world it describes. Sometimes it gets a little lost in its lingo for me since the author doesn't hand-feed you every detail so you get thrown in with a mild understanding of the big picture but have to struggle just as much as the characters to find out what exactly is going on, and uncover a little bit at a time the truth of the past and what led up to these events. The characters are all sympathetic, even the ones you learn to hate, in the battle for survival that pits human against human, Yellow Card against Thai, White Shirt against Windups... And you aren't sure who is going to win as you turn each page with bated breath.